Help me reach 1,000 YouTube subscribers! Okay, I'm on my knees. 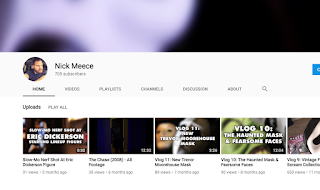 I need to reach 1,000 channel subscribers on YouTube to keep my videos monetized. As of right now, I have 705. So I need 295 more. Even if you hate my channel and never watch my vlogs, please consider subscribing anyway because deep down, you love me, you really, really love me. Maybe you don't love me. That's fine. Just help a brother out. I will returns subs if that helps. For the record, I don't disagree with YouTube's new monetization policies. I think it'll actually help them moving forward. But it's hurting me in the present. Also, and let this be on the record, too...I don't make a lot of money on YouTube. A couple bucks a month, tops. Honest. But that extremely small amount helps with keeping my domain name(s) and helps with running MorbidMuch, Sequel Buzz, Scream-Thrillogy and Haunted House Indy. Okay, I'm done with my plea. Thanks for reading!